If you’re reading this, we have a lot in common. Like you, we know there’s something very special about dolphins. Because you share our fascination with dolphins, we asked our marine biologists to round up some remarkable dolphin facts so you can fully appreciate why dolphins are such an amazing species. Once you read these, you'll know just about everything you ever wanted to know about dolphins, and just a bit more. Which species of dolphin swims sideways. How dolphins communicate and locate prey. Which species can weigh 11 tons and which ones only weigh 350 pounds. Which species have hair and which ones are bright pink. Warm-blooded means that their body is able to regulate its own temperature, so they stay warm even when the water temperatures around them are cold. Some of their native environments, such as the waters of the northern Pacific Ocean, can get very chilly. In these places, being warm-blooded is a big advantage for survival. Being warm-blooded also makes dolphins and other cetaceans less prone to infections and other health conditions that affect cold-blooded species. Another central feature of marine mammals is that they have lungs, not gills. Dolphins, like whales, need to periodically come to the surface to replenish their air supply. They have blowholes that they close while diving, and then open at the surface for air. Marine mammals have also adapted in some special ways to thrive in an aquatic environment. For instance, dolphins exchange 80% of the air in their lungs with each breath, while humans are only capable of exchanging 17%. Marine mammals also have a greater capacity for oxygen storage in their lungs, blood, and muscles. All of this creates a more efficient use of the oxygen in their bodies and is what allows many species to dive for extended periods of time. 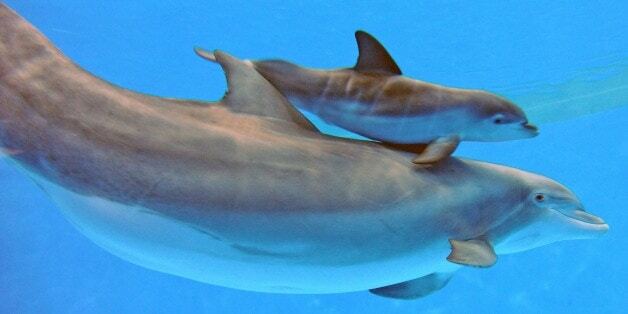 Dolphins give birth to live young and do not lay eggs. They can get pregnant on average every two to four years once they're mature, although some species can have 5-7 years between births. Dolphin calves tend to stay close to their mothers for a few years before venturing off on their own. However, some calves will stay with their mothers for a lifetime. Along with gestating their young, dolphins produce milk to nourish them. It may seem tricky for calves to nurse underwater, but dolphins have adapted some special physiological traits to work around this issue. Did you know that dolphins start life with body hair? Newborn calves have hairs on their rostrum (their beak) that fall out soon after birth This is believed to be an evolutionary remnant from when they lived on land. Dolphins are considered one of the world's most intelligent animals, and they have several cognitive abilities that set them apart. Many researchers consider intelligence to be a combination of perception, communication, and problem-solving. You can see dolphin intelligence in action in the way they communicate and use tools. Communication is a big part of how dolphins socialize and hunt. They have the ability to echolocate with a series of clicks, allowing them to find other dolphins or similar species and prey even in the low-light conditions of the ocean. They can do more, too. Did you know that dolphin echolocation allows them to detect surgically implanted metal in swimming humans? The human body is comprised of about 75% water, and once in the water, we provide a prime structure for echolocation. This is how dolphins are able to discern that the metal is denser than human flesh, which is mostly water. Dolphins also have a complicated method of communicating with each other. From an outside perspective, dolphins may seem to communicate much like humans. However, researchers are still investigating both how dolphins communicate and what information they are able to pass to each other. Despite lacking hands, dolphins are adept at using tools. For instance, one of their more specialized tricks is to carry a sponge at the end of their beak, also know as a rostrum. This acts like padding, protecting them from sharp rocks as they dig through the seafloor for food. Zoological facilities, aquariums, and other places, such as Dolphins Plus, give people a way to learn more about these remarkable animals. The educated professionals who work there can share general information, threats and conservation efforts, and the latest research findings on how these animals cognitively function, communicate, and adapt. These places are both fun for the viewing public and offer a great learning experience. One of the fascinating things about these marine mammals is their complex methods of communication. So how do dolphins communicate? There are three main ways: whistles, echolocation, and social communication. Dolphins communicate through more than just clicks and whistles. They can also slap the water's surface with their tail or bodies, which is officially termed breaching. Dolphins can make squeaks, buzzes, whistles, clicks, and a wide array of other crazy noises.. These whistles can be heard by others of the species from miles away. 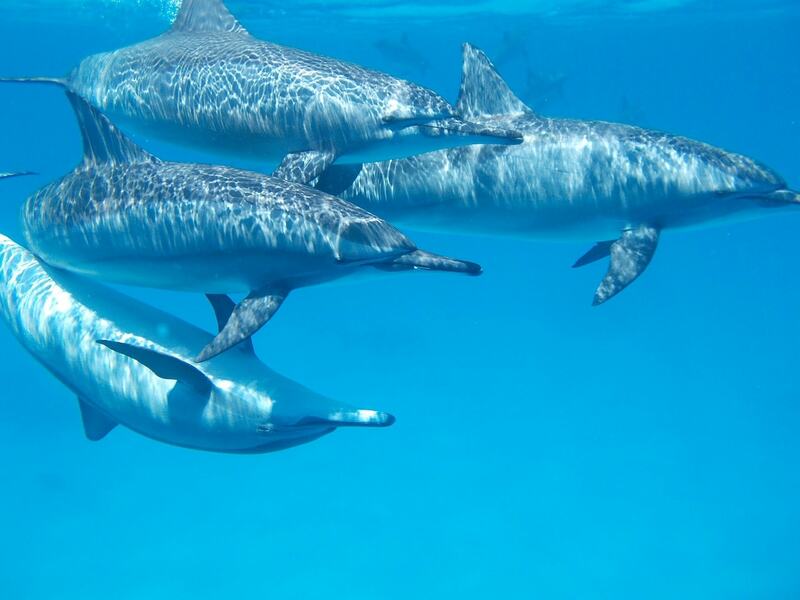 Their whistle repertoire can change as they get older, and dolphins who bond with one another can learn each others signature whistles and often copy each other’s whistles. Click on the links below to listen to the whistles of Atlantic bottlenose dolphins at Dolphins Plus. Echolocation serves for both communication and for navigation. Echolocation is seeing with sound, much like sonar on a submarine. The dolphin emits a sound and then listens for the echo as that sound bounces off of objects, these sound waves travel back to the dolphin. Dolphins are able to get much more information out of the sound than humans. This includes the size and shape of objects or obstructions near them and even what material they are made of. There are dozens of species of dolphins and each has their own unique habitats, appearance, and behaviors. 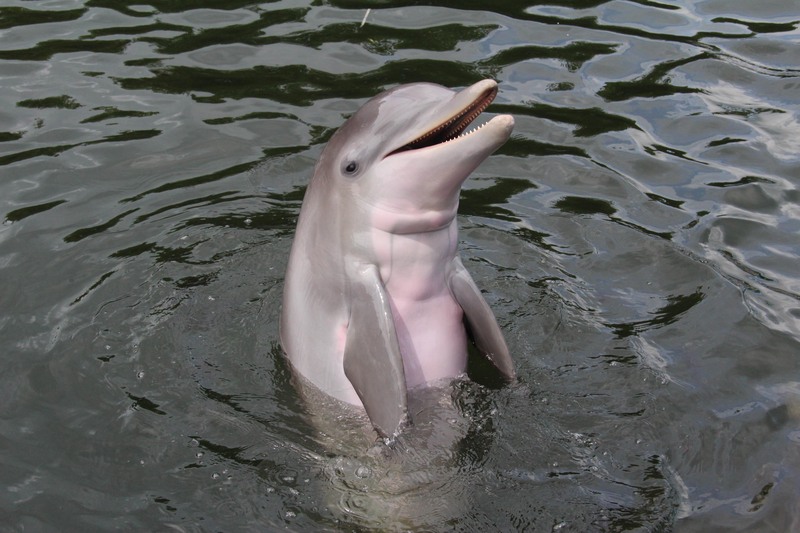 Many dolphins are grey in color, some species have various patterns of black and white, and a few are even pink. In terms of behavior, all species of dolphins are quite gregarious. In fact, many dolphin species can form groups of over 1,000 individuals, known as super pods! Dolphins come in all shapes and sizes, and each species has their own unique features. Here's how to recognize a few of the most striking and unusual dolphin species, although we’re warning you right now that we’re saving the most popular species for last! You may not expect to find a dolphin in freshwater areas, but this species thrives in the Amazon River. It's also called the boto or bufeo dolphin and its skin turns pink as it matures. Here's another entry to the list of freshwater dolphins. As you'd guess from the name, this species can be found in the Ganges River in India. It has a unique habit of swimming sideways, allowing it to sidle up to food. This striking, highly social dolphin species is found off the coast of Argentina and in parts of the Indian Ocean. It's best known for a panda-like black and white color pattern. Risso's dolphins love deeper waters, where they seek out a diet of squid and other deepwater fish species. However, their favorite prey fights back and older members of this species may have a mottled pattern of battle scars from squid attacks. Did you know that killer whales are members of the dolphin family? These animals, also commonly called orcas, are the world's largest dolphins. How big are they? Larger individuals can grow over 30 feet long and weigh 11 tons. They typically have a bold black and white pattern similar to Commerson's dolphin. They use some of the most sophisticated and unusual communications of all dolphin species. These playful dolphins have earned their name, in part, for the high jumping spins they take out of the water. These aerial acrobatic tricks make them a favorite among dolphin-watchers. They are found throughout the world, preferring warm and shallow waters. Once you've seen one of these members of the dolphin family, you'll never forget them. The short-finned pilot whale has an unusual, squared-off head and lacks the long beak of most dolphin species. Pilot whales are very social and travel in pods of up to 50 members. This shy, elusive dolphin species share a similar black and white color pattern to killer whales, but they are a fraction of the size. They are rarely seen by humans as hourglass dolphins are one of the few dolphin species who favors the Antarctic area. 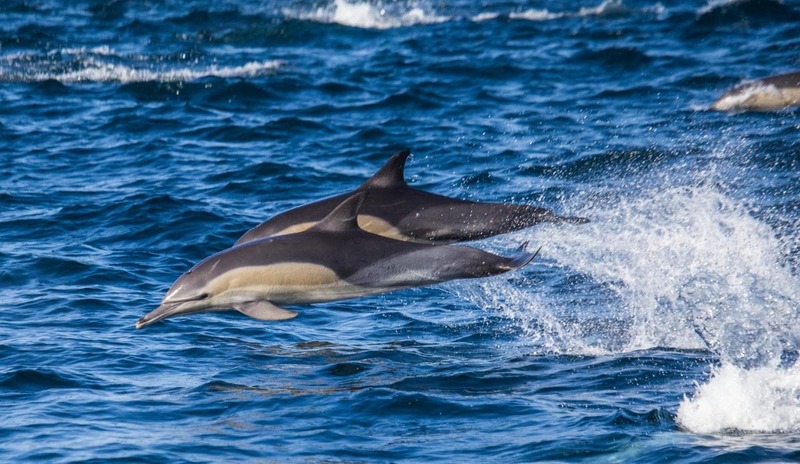 Although the bottlenose is the most famous dolphin species, there is a good chance you've seen a striped dolphin in action at an aquatic center. These attractively striped animals can live in very large groups, and they perform elaborate acrobatics when they leap into the air. We saved the bottlenose dolphin for last for two reasons. It’s one of the most popular species. Flipper, the world's most famous dolphin, was a bottlenose dolphin. The other reason is they hold a special place in our hearts, since most the dolphins at Dolphins Plus are Atlantic bottlenose dolphins. These majestic animals are dark grey and, as you'd expect from the name, have a short and blunt rostrum. Bottlenose dolphins live throughout the world in warmer waters. They have a number of interesting features ranging from how they look to how they interact with each other. Bottlenose dolphins are varying shades of grey with a lighter belly (counter-shading), which helps conceal them from predators. They have a streamlined body that allows them to swim up to 20 mph. The typical length for an adult bottlenose dolphin can range between 6 to over 12 feet and they can weigh over a 1,000 pounds. The bottlenose dolphin's diet varies depending on the region where they live. These skillful predators primarily eat fish, but can also hunt other marine life such as squid. Dolphins have some sophisticated ways to catch a meal. Some of their tactics include herding prey into muddy areas and even catching leaping fish out of the air. They tend to hunt in a group, which makes the foraging process very effective. Dolphins thrive in both tropical and cooler, more temperate waters. Humans have encountered dolphin pods both near shore and in deep offshore waters like the Indian Ocean. Some dolphin groups stay in one area for a lifetime while others migrate. When their calves are born they typically weigh around 30-40 pounds, compared to full-grown dolphins that can weigh over a 1,000 pounds. That's quite a difference! 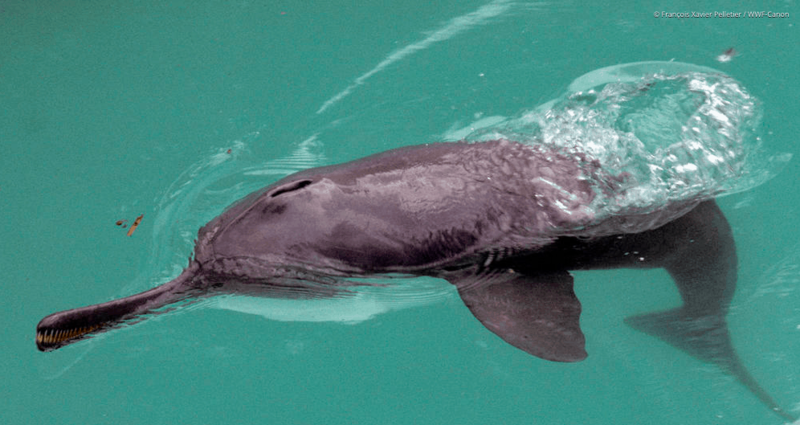 Bottlenose dolphins start out quite dark in color, lightening as they mature. Dolphins are under threat worldwide, mainly human generated threats. Two of the biggest issues are entanglement in fishing gear and nets, and pollution. Dolphins often pursue the same fish species that commercial fishing ships are hunting and may get accidentally caught in their nets. They can also get tangled in discarded ropes and gear, causing a significant amount of marine mammal deaths each year. Finally, the human-created pollution that is affecting the world's oceans is causing a wide variety of problems for dolphins, ranging from diseases to difficulty finding food. Dolphins do not mate for life. Dolphin reproduction often involves putting on displays including posturing and vocalizations to attract a mate. Dolphins gestate for 12 months and calves are typically born tail first, and they are primarily cared for by the mothers and other related and unrelated females. Dolphin habitats can be are found around the world, from tropical to temperate regions. Although they are warm-blooded, they tend to avoid oceans near the Arctic and Antarctic. The bottlenose dolphin, one of the most well-known species, prefers water between 50 and 90 degrees Fahrenheit. However, each species has its own preferences. Dolphin habitats can be found everywhere from open oceans to coastlines to river basins. Some species are migratory and adapt well to changes in their environment. They can move to areas in their temperature range that offer sufficient numbers of fish. Other species are closely tied to one place and come under threat when humans begin developing the area. This is home to several species including bottlenose, spinner, and Pacific white-sided dolphins. Dolphins who live in the deep ocean are better adapted to tolerating cold water than their shore-loving counterparts. Here you'll find the preferred home of bottlenose, humpback, and spotted dolphins. These species have been found from Nova Scotia to Patagonia and everywhere in between. The Indian Ocean is the native environment for large numbers of bottlenose, spinner, and common dolphins. Off the coast of East Africa, you'll also find the highly endangered humpback dolphin. Dolphins are best known for living in the ocean, but there are also endangered freshwater varieties. 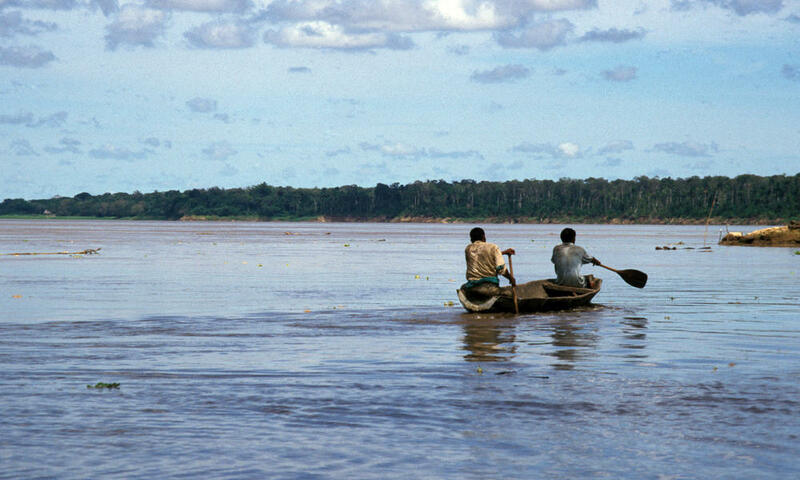 Did you know that there are dolphins in the Amazon River? The Amazon River dolphin is comparatively small, weighing up to 350 pounds, and adults are bright pink. Despite living throughout the world, dolphins are currently facing a lot of threats. Climate change, pollution including trash and debris, and aggressive fishing operations are impacting all species of dolphins. This is why marine mammal facilities are important for protecting and researching these animals. They are able to educate the public about these remarkable mammals, promote environmental stewardship, and give scientists an opportunity to understand the species more in depth. Are dolphins endangered? Yes, there are dozens of species of dolphin that are endangered and now extinct. Some of the most threatened species are the ones that come into contact with humans most frequently. This includes the Yangtze River dolphin, the Maui dolphin, the Ganges River dolphin, and the short-beaked common dolphin. Each of these species face significant challenges for their future. The Maui dolphin, found off the coast of New Zealand, is a highly endangered species with (an estimated) less than 100 members left. The species decline is due to many issues, one of which is that they are very slow breeders. Most dolphins reproduce an average of every couple of years, but for this species, it's 6-7 years. They also face threats to their habitats and food sources. The Ganges River dolphin is seen in India, Nepal, and Bangladesh. Because it lives in some of the most populated areas of the world, this species is hit hard by human impact. Some major threats include river pollution, lowered levels of river water, and dam building. The short-beaked common dolphin is found in the Mediterranean in declining numbers. These colorful animals are endangered by fishing accidents and the increasing pollution and trash building up in the Mediterranean Sea. Should You Swim with Dolphins in the Wild? Most of the time, dolphins are not dangerous. Some are friendly and curious while others are skittish and avoid human contact. However, don't forget that dolphins are wild animals and can be unpredictable. 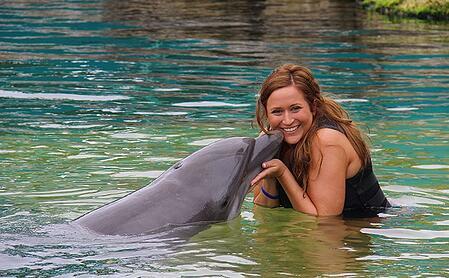 Are you interested in swimming with dolphins? Don't do this in the wild; appreciate them from a distance. However, if you want this experience, you can go to a marine facility and have a safe encounter there. Do not feed wild dolphins. It teaches them to be dependent on humans, can lure them into dangerous areas along the shore, and encourages bad habits. If you see someone feeding dolphins in the wild, report them to the authorities. They may think they're helping, but they're causing more harm in the long run. Do not touch or pet dolphins, even if they come close. Stay at a safe distance. If you want to view dolphins from an aircraft, check with the company ahead of time to make sure they stay at least 1,000 feet above the water to avoid disorienting the animals. Never use a drone to take picture of a dolphin from above. Stay quiet and avoid loud noises. A startled dolphin may end up separated from their pod. Don't throw unused bait into the water. Discard unwanted or waste fishing lines safely. You can also fish with specially designed dissolving hooks instead of the stainless steel varieties. This last point is very important. 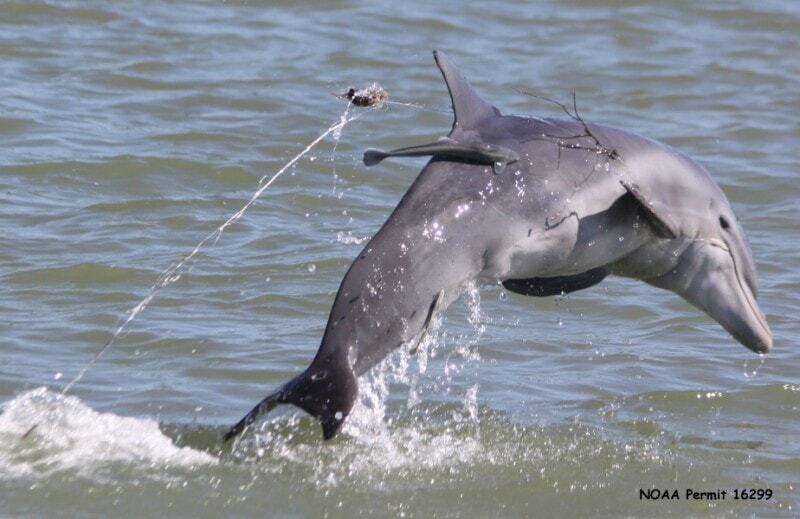 Fishing lines, fish hooks, and discarded netting are one of the bigger threats to dolphins. Even if the animal manages to free itself, the resulting wounds attract predators and leave them vulnerable to infection. Can Dolphins and Humans Coexist? Humanity still has a lot to learn from and about these marine mammals. Exactly how intelligent are they? How did they evolve? What's the future for these species? These are important questions that will take more study to answer. That's why responsible research and interaction is so important. If you want to support dolphins, start at home by going green and reducing waste. Meanwhile, if you want to have a dolphin encounter, do a little research first to make sure you're working with an ethical company. Swimming with the dolphins can be a wonderful, even life-changing experience, but should never be done in the wild. Instead, work with a company that can coordinate this and looks out for both your and the dolphin's well-being.